As many of you remember last year in February, a large section of Orr Springs Road washed out, and a temporary bridge was constructed. Over the past several months, we’ve been keeping an ear to the ground on when the next stage of the road’s repair will occur. Thursday June 7th and Friday June 8th, from 6:00AM to 6:00PM each day (after 6:00PM each day, the road will be open until 6:00AM the next day). Next week the road will be open full time! However, Monday through Friday, between the hours of 6:00AM to 6:00PM, expect delays of up to 20 minutes. 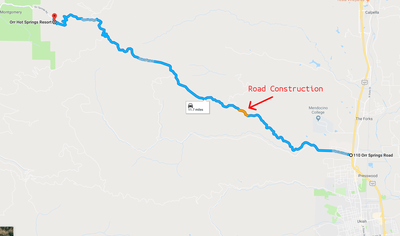 For the final two days the road is closed, there are several alternate routes to get to Orr Hot Springs (see below), several of which take you through Anderson Valley, a world-class wine tasting area of California. If you have any questions, feel free to contact our Reservations Department at (707) 462-6277, or by email at orrreservations@gmail.com. If you are traveling from the South (San Francisco, Santa Rosa, etc. ), this alternate route will add approximately 45 minutes to 1 hour of drive time. Fortunately it does take you directly through the world-class Anderson Valley Wine Vineyards. The drive itself is also very beautiful. Total drive time from Cloverdale: approximately 2 hours. From US-101, near the town of Cloverdale, take exit 522 for CA-128 W toward Fort Bragg/Mendocino. Turn left onto CA-128 W.
After 0.8 miles, turn right to stay on CA-128 W.
Turn right onto Flynn Creek Road, and travel 8.4 miles to Comptche. Turn right onto Comptche Ukiah Road, and travel 16.8 miles to Orr Hot Springs (mile marker 31.31). We would recommend stopping in Santa Rosa to purchase food, especially if you are looking for organic options. Do not trust GPS. Sometimes it's fine, sometimes it tries to take you over the impassable mountains. Print these directions before leaving! If you are traveling from the North (Eureka, Arcata, etc.) this alternate route will add approximately 45 minutes to 1 hour of drive time, and will take you over the Coastal Route and along Hwy 1. Total drive time from Willits: approximately 2 hours. Once you are in the town of Willits on Main Street, turn right onto State Hwy 20 W/Flower Street/Fort Bragg Road. Travel 33 miles over Hwy 20. Turn left onto CA-1 and continue South for 8.6 miles. Approximately 0.8 miles South of Mendocino, turn left on Comptche Ukiah Road (Comptche Ukiah road turns into Orr Springs Road, east of Comptche). Travel approximately 31 miles to Orr Hot Springs (mile marker 31.31). We would recommend stopping in either Willits (Safeway), Fort Bragg (Safeway/Harvest Market), or Mendocino (Harvest Market). 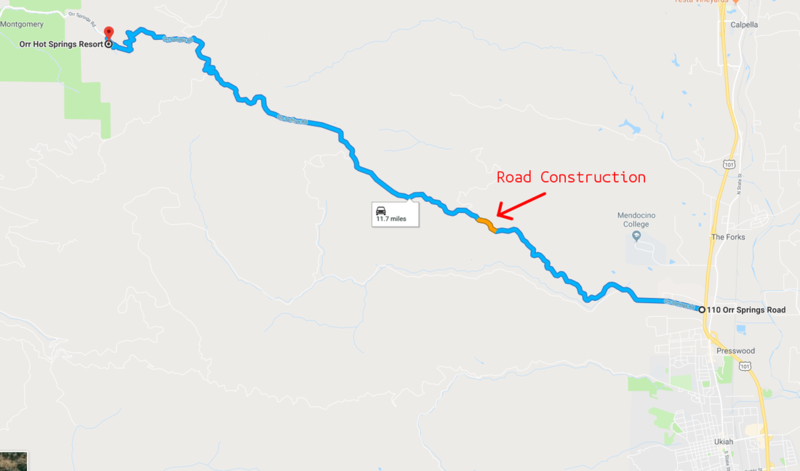 If you are traveling from Ukiah, this alternate route will add approximately 1.25 hours of drive time. Fortunately it does take you directly through the world-class Anderson Valley Wine Vineyards. The drive itself is also very beautiful. Total drive time from Ukiah: approximately 2 hours. On the southernmost end of South State Street in Ukiah, turn right onto CA-253 W, and travel 16.9 miles. Turn right onto CA-128 W, and travel 17.8 miles. There are several large chain grocery stores (Safeway, Raley's, etc.) in Ukiah. For organic options many of our guests like shopping at the Ukiah Co-op.